Search Results for "school hall"
Cute ballerinas having practice at ballet hall. Beautiful ballet girls doing exercises at ballet barre. School of professional ballet. Smiling little nice girl with ponytail holding on office chair. Friend guy driving girl. Laugh and fun. Indoors. School. Hall. 1960s: School hall. Man talks to young woman. 1970s: Teenage boy gets up from classroom desk and walks alone down school hall. Lecture hall at the college, school, university. Conference hall. Warm daylight. NEW-YORK - AUG 22, 2014: Lincoln Center with Juilliard School and Avery Fisher Hall at summer day. Aerial view. Juilliard School was opened 1969. NEW-YORK - AUG 22, 2014: Juilliard School and Avery Fisher Hall near Hearst Plaza with Paul Milstein Pool and Terrace in Lincoln Center. Aerial view. Avery Fisher Hall was opened 1962. Basketball game. Teens train in the school old sports hall, throw the ball in the basket and run with the ball. Basketball training. 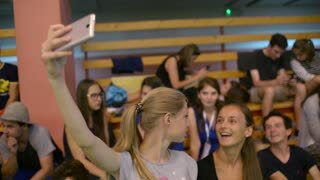 Teens train in the school old sports hall. Coordination ladder exercises. Basketball training. Teens train in the school old sports hall, throw the ball in the basket and run with the ball. Basketball training. Teens train in the school old sports hall. Teenager dribbling the ball very quickly through and around his legs.